There are few things more personal than getting a handwritten letter in the mail. Opening an envelope addressed to you, the feeling and smell of the paper, the ink slightly raised from the page–the experience of opening a letter is sensory and personal. When creating an invitation for your event, consider that hand lettering stands out in this digital age. Since the invitation is the first glimpse your guests have of your event, an invitee who receives a hand lettered invitation immediately feels appreciated and knows to anticipate an intimate affair with your personal touches. Lettering is a true art form with a rich history, and incorporating lettering into your invitations conveys a sense of timelessness. Modern Calligraphy, for example, is a great way to hint at the past tradition of calligraphy while perhaps incorporating a more fluid style and modern details, the perfect mix of elegant and relaxed. Working with a calligrapher or letterer enables you to create something unique to you and your event. When planning your invitation with your designer, you’ll be able to truly customize your invitation suite so that it reflects you and your significant other and your special celebration together. Since a free-hand wedding invitation is entirely custom, you are able to add interesting details such as a unique floral illustration, a drawing of your venue, or a meaningful quote. Wedding invitation designers are artists, so take advantage of their knowledge and particular skill set. Don’t hesitate to ask plenty of questions, and give them examples that are similar to what you are looking for. Remember to listen to their suggestions and trust their artistic instincts. Your wedding invitation becomes a keepsake. 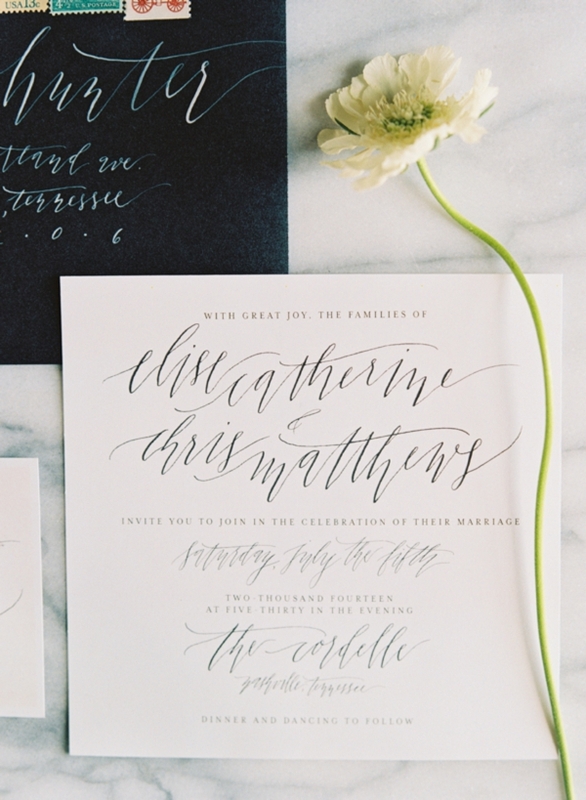 More than any favor, a hand lettered invitation is a tangible memento of your celebration. Just as a letter in the mail becomes a special priceless treasure, your invitation becomes a special part of that tradition. This article was written specifically for Once Wed. Calligraphy by Jessie Early and photo by Austin Gros.